Fredy Studer, drums, cymbals, gongs, metal, multiple percussion; Hamid Drake, drums, cymbals, metal, frame drum, tabla, multiple percussion; Michael Zerang, drums, cymbals, gongs, metal, darabuka, zither, tambourine, whistles, bells, multiple percussion. 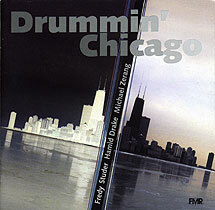 Recorded at Experimental Sound Studio, Chicago on 7 January 2003. Cover photograph (reproduced above) by Marianne Halter; artwork by Josef Jutz.